Today, there are so many different online gaming options to choose from. New and exciting games are being released all the time, but it seems that one classic community game has also become one of the most popular online games today. Bingo used to be a game that drew in a particular crowd � mainly ladies over a certain age. But now, with its renaissance online, there are players of all ages and both sexes, who favour bingo as their number one online game. Today, there are so many bingo sites to choose from � each with their own distinctive style. 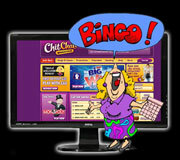 For example, there's www.chitchatbingo.co.uk where the focus is on the fun that online bingo can bring. The sites has almost as many chat games going on in the chat rooms as scheduled bingo games in the different bingo ball rooms. Chat games really add a buzz to the atmosphere in the chat rooms where you can meet other players. You can instantly see the appeal of playing online bingo. The outcome of each game is purely dependent on good luck � that you buy a ticket which has the winning combination of numbers which are picked out at random. Not only is it simple and easy to play, but it's also cheap too. You can buy tickets for online bingo games for pennies and yet the prizes can be life-changing. There's no need to concentrate on the game if you've been distracted by the chat rooms or have something pressing to do away from the screen. Of course, most people enjoy watching the games play out, but with the auto-daub software on online bingo sites, you don't even need to mark off your numbers � this is done automatically for you and any wins are credited directly to your playing account balance. You'll also find other online games on most bingo sites as well � including slots and scratches, progressives and casino games. That�s the great thing about joining your favourite bingo site � you can always find new games to play when you feel like a change.